Nexter is fully present, under the KNDS Group banner (KMW + NEXTER Defense Systems) for this year’s edition of the Defense & Security International Exhibition, Eurosatory, taking place in Paris from 11-15 June 2018. Nexter is demonstrating its status as the leading French systems integrator. 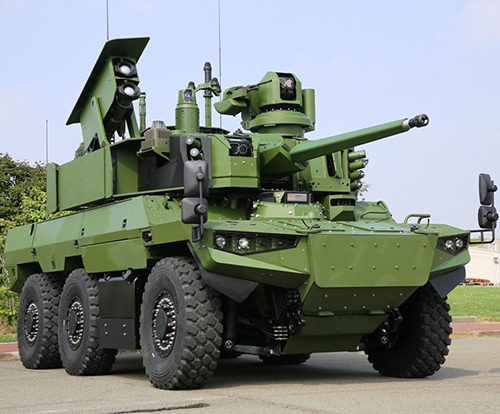 Through the creation of KNDS, Nexter, together with its partner KMW, occupy a position as the leader in the Franco-German and European land defense industry. This global meeting is a privileged moment for the company, allowing Nexter to display its entire range. As the main supplier of the French army, Nexter shows its commitment in the SCORPION program. The JAGUAR (EBRC) is exhibited on the Nexter and Defense Ministry booth for the first time, alongside his partner in the EBMR program, the GRIFFON (VBMR). The renovated LECLERC tank completes this static display on the Nexter booth. The latest vehicle of the SCORPION range, the Lightweight VBMR, is presented in a full size holographic animation. Finally, Nexter’s SEMBA embedded simulation solution is shown on the static display of the Ministry of Defense (zone Vulcain). The other systems and products from the Group are also presented, including: the VBCI APC [Troop Transport], the CAESAR® family range, with the 6x6 and 8x8 versions and the 105LG1 artillery system. The digital dimension of the Group is illustrated by an augmented platform, thanks to the NervaÒ and OPTIOÒ robots. In addition, a homeland security version of TITUS is participating in dynamic demonstrations by the elite police unit RAID. As an important part of Nexter, the third largest European player in this field, the Ammunition Business Unit (ABU), including Mecar, Simmel Difesa and Nexter Munitions, is exhibiting its full range of ammunition from 20 mm to 155 mm, meeting the needs of the three domains: Naval, Land and Air. The 40 mm turret, equipped with the CTA International cannon (a joint company between Nexter and BAE), the ARX 25Ò and the P20, demonstrate the group’s range of weapons and turrets. The other Nexter Group’s subsidiaries are also present at Eurosatory in order to promote their expertise and solutions, especially the activities of support and services, through a mobile workshop as well as subsidiary equipment.